As part of its training center La Belle Classe Academy, dedicated to the yachting professionals, the Yacht Club de Monaco has partnered with the yacht brokerage company Bluewater to organize, on April 5, a culinary contest for yacht chefs. This 2018 edition saw 12 leaders of different nationalities compete. All 12 are superyachts chefs onboard vessels over 40 meters, from which 5 fly the Monaco Yacht Club's flag: Rola (47m), Black Legend (50m), Sokar (64m), Royal Romance (92 m) and the very emblematic Lady Moura (105 m). Organized at the Monaco Yacht Club, with the support of its Chef Christian Plumail, this competition has enabled yacht owners and all gastronomy enthusiasts to watch chefs evolve on workstations inspired by the limited spaces of the galleys of certain yachts. 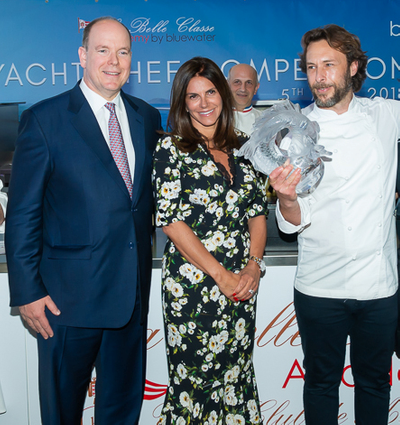 Chaired by HSH Prince Albert II and composed of starred chefs and meilleurs ouvriers of the year, the jury was able to taste, deliberate and distribute the points before handing a magnificent Lalique crystal trophy to the winner, Pablo Albuerne, Chef onboard the 53m Tales. Sabrina Monteleone-Oeino, as the owner of the new Lalique boutique in Monaco, had the honor and the pleasure of representing this iconic brand at the presentation of the frosted crystal 'two fish' sculpture.